Warning: If you are going to read this entry further you must admit to being one of those children who would soak the Lucky Charms in milk for fifteen minutes before eating breakfast so you could drink the white creamy juice down afterwards like a sweet bubble of sin. Or alternatively, be one of those children who wadded up pieces of Wonder bread and rolled it between your dirty palms to produce dense balls of doughy, snack goodness. If you have gotten this far without throwing up you will appreciate the rest of this story. Last week the Cute Gardener and I did something we NEVER do … drove to Koreatown’s Line Hotel during rush hour traffic simply for the chance to stand in line and buy some of Christina Tosi’s baked goods. As co-owner of Momofuku Milk Bar in NYC along with celeb chef David Chang, she is renowned for desserts like Crack Pie that causes sugar addicts to relapse. We aren’t star fuckers, so Tosi in person signing her new book of savory recipes did nothing for us … it was simply the opportunity to buy compost cookies on the West Coast that baited us out of our normal hermit-tude. While she penned autographs five feet away with L.A.’s most famous POThead Roy Choi we stood in line for the baked goods, knowing where our priorities lay. We were of the lucky set that was able to order multiple menu items before the growing demand topped the orders off at three items per customer. Which is great, because I not only wanted my favorite cookies of Tosi’s which the CG picks up on his annual business trips to New York but also, I was craving a chance to taste the Birthday Cake Truffles. With a load of sugar bombs in a brown paper bag, we left the mob of Tosi groupies and went for ramen downtown before heading home to our couch and ripping open the box of bizarre sprinkled truffles that would come to ironically steal my heart. As I share the beauty of the Birthday Cake Truffles, I am reminded of my saucy Aussie friend Charlotte who I’ve spent many an afternoon with during my life cooking food curiosities. On one occasion I was quite taken with a mythological, traditional food from her Australian upbringing called Fairy Bread, which she was making en masse for her daughter’s birthday party. This concoction was basically a sandwich of rainbow sprinkles on smeared butter on white bread. It sounded so utterly gross that I knew it had to be good. 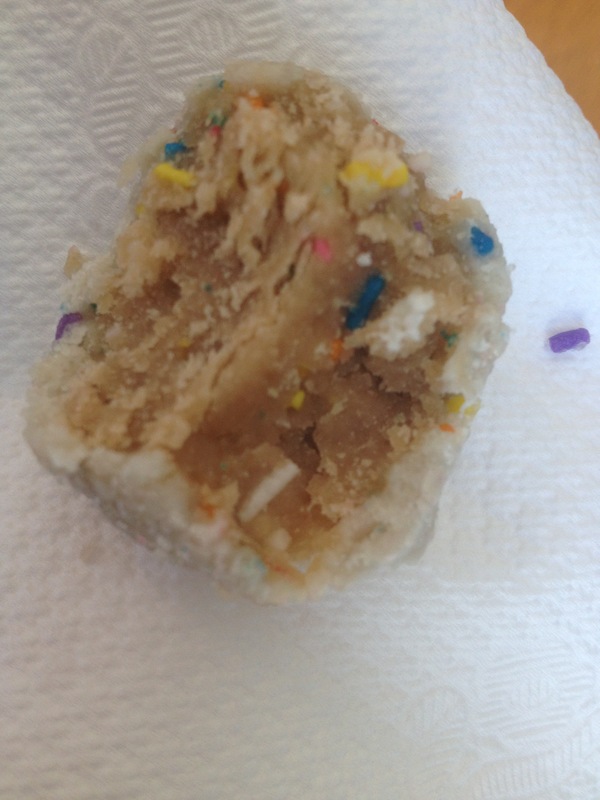 Birthday Cake Truffles are the grown up version of Fairy Bread. Through some online research, I learned that these truffles are basically the remnants of white frosted birthday cake that get all squished together at the end of the day. 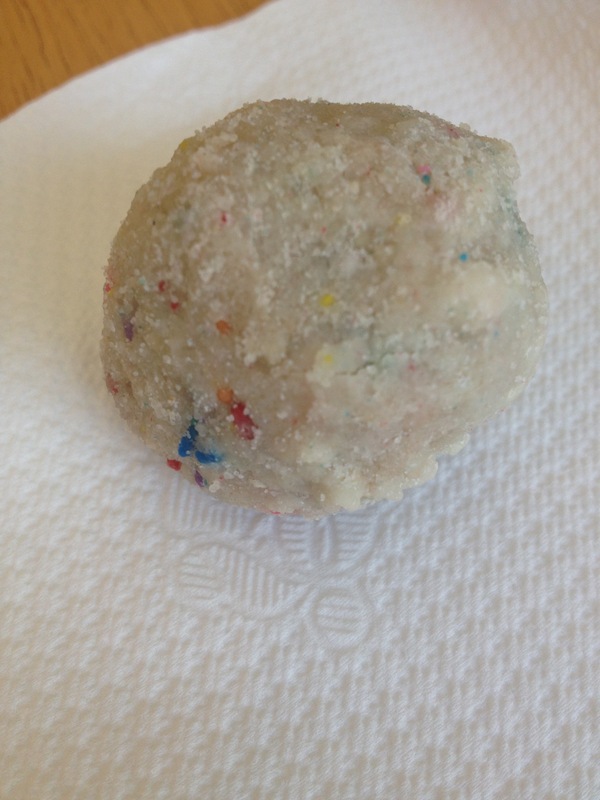 The squishy mess is then soaked in vanilla milk, rolled in melted white chocolate to create a shell coating and then dusted with sand (sugar and rainbow sprinkles). The box of 12 was 16 dollars and after eating one I was worried that we had bought too many. Biting into just one was like injecting liquid cane syrup directly into the veins. It was super sweet with a crumbly shell and a mushy middle that tasted like a supreme cake pop center when frigidly cold. But within days, the balls had mysteriously all rolled themselves down my throat. That’s what Christina Tosi does best though—takes us on a stroll through the latchkey kitchens of our youth where we did the best we could with those convenience ingredients we had. All the leftover Golden Grahams cereal bits thrown into a batch of cookie dough for crunch and texture? Absolutely brilliant idea! Tang on toast? Of course! When you’re twelve that sounds divine. Mushed up cake with bleeding sprinkle color trails? Makes perfect sense. It is a good thing for me that her creations are normally the length of a continent away. Raised by an Iowan mother, I learned very early on that corn was like candy: grilled on the cob and smothered in butter in the summer, creamed into sweet casseroles with saltine cracker crusts for Thanksgiving dinner, and toppled in kernels over mashed potatoes next to meat loaf and barbecued ribs for dinner. My very favorite corn dish of all time was a hot steaming corn bread muffin, studded with jalapeno and drizzled with honey. Even though I had been raised on the proper applications of the cob, I rejected corn in my early thirties, much like large amounts of sugar, empty carbs, white flour and candy, when high fructose syrup became touted as the root of all evil and corn started getting a bad rap. After a good solid decade without the golden vegetable, I slowly but surely, over the course of the last five years, opened my heart up to corn again. Part of this was due to the Cute Gardener’s crops that, although few and far between each season, produce an ear you can eat right off the stalk. Freshness like that is hard to argue with, criticize or ban. A bonafide lover of that distinct corn taste was reborn and I have come to eat my corn in moderation always seeking out special ways to do so. 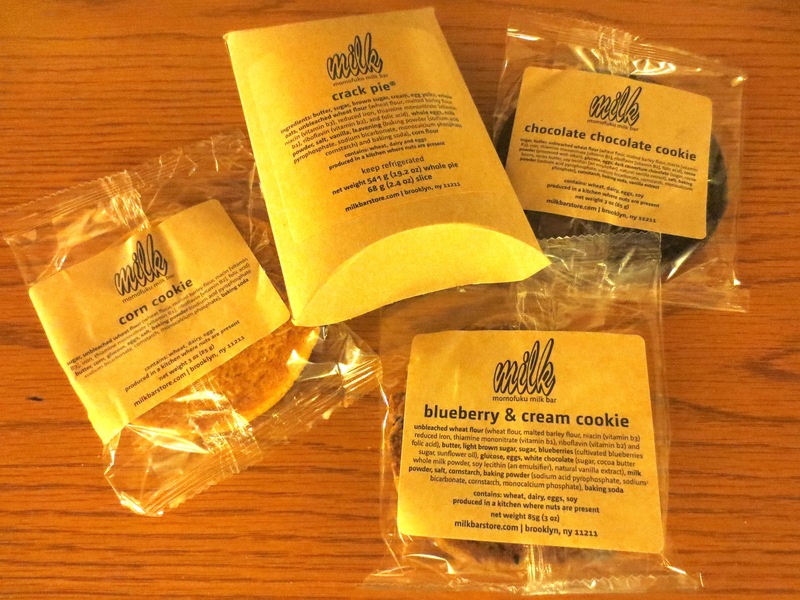 Last year, after the CG took a business trip to New York he brought back Christina Tosi-created cookies from the Momofuku Milk Bar per my pleading request. Amidst the decadence of the Chocolate Chocolate and Blueberry Cream cookies was a perfect specimen called simply Corn. It was a beautiful dense disk the color of the sun, not too sweet and chewy in the middle while the edges remained crisp and buttery. It tasted like my favorite varieties of corn bread yet tarted up with the richness of burnt sugar. I fell head over heels in love and wanted another one ever since. This year when the CG returned from his annual business trip, to my delight, he carried a box in his hands of the very mix to make these beautiful corn cookies. 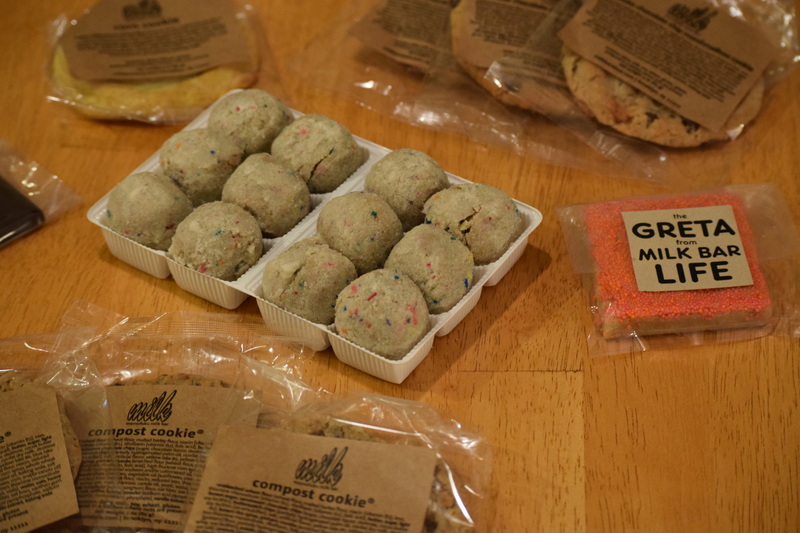 So, although I heartily wolfed down the indulgent corn flake chocolate marshmallow and compost cookies that were new to me this year from Momofuku, and equally phenomenal, it was the night he baked the corn cookies that made me swoon the most. They came out from the oven as if they were on crack. I carefully apportioned out my half of the dozen made so that I would be able to savor one per evening for six nights. Unfortunately, I made a trip to my hometown with my bag of allotments in tow and my family and friends scavenged them up like a flock of vultures. 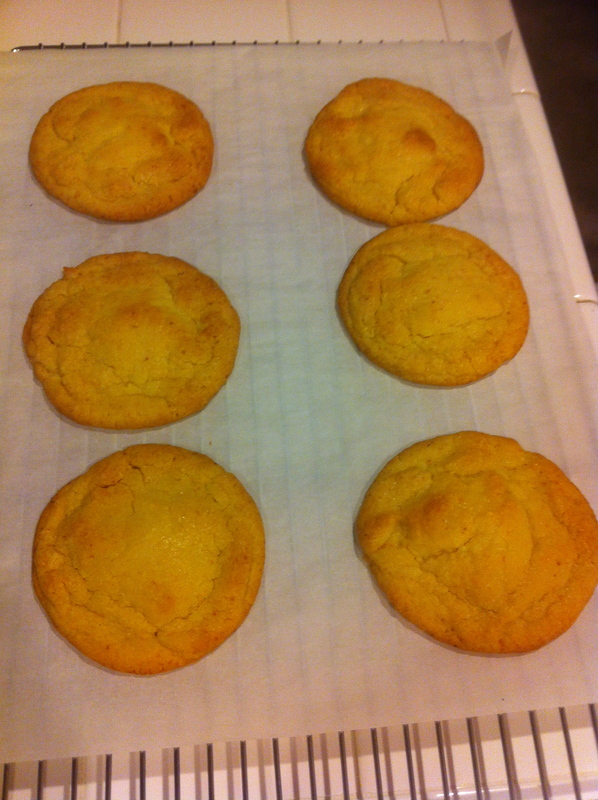 Fortunately, I was able to find a recipe online for the cookies so that I can have them anytime I want. That is, if I am extra sweet to the CG, since he is the baker of our bunch. 1. Combine the butter and sugar in the bowl of a stand mixer fitted with the paddle attachment and cream together on medium-high for 2 to 3 minutes. Scrape down the sides of the bowl, add the egg, and beat for 7 to 8 minutes. 2. Reduce the mixer speed to low and add the flour, corn flour, corn powder, baking powder, baking soda, and salt. Mix just until the dough comes together, no longer than 1 minute. Scrape down the sides of the bowl. 3. Using a 2 3/4-ounce ice cream scoop (or a 1/3-cup measure), portion out the dough onto a parchment-lined sheet pan. Pat the tops of the cookie dough domes flat. Wrap the sheet pan tightly in plastic wrap and refrigerate for at least 1 hour, or up to 1 week. Do not bake your cookies from room temperature– they will not bake properly. 4. Heat the oven to 350°F. 5. Arrange the chilled dough a minimum of 4 inches apart on parchment- or Silpat-lined sheet pans. Bake for 18 minutes. The cookies will puff, crackle, and spread. After 18 minutes, they should be faintly browned on the edges yet still bright yellow in the center; give them an extra minute if not. keep fresh for 5 days; in the freezer, they will keep for 1 month. I spent four days on a Chinese macrobiotic cleanse a few weeks back while the Cute Gardener went to New York City for a business trip. When I told him I was all clean from the Thanksgiving food onslaught, he told me I better be ready to get dirtied up again because he was bringing home cookies from the Momofuku Milk Bar. Instead of thinking, “Oh, I just spent all this time clearing out my organs, skin and pores so I will go light on the cookies when he brings them home,” I immediately starting feeling the joy a cocaine addict gets knowing he’s going to score later in the evening while imagining just how many cookies I could possibly stuff into my newly minted and hollowed out gut. Because you see, these weren’t ordinary cookies but indeed more like crack. 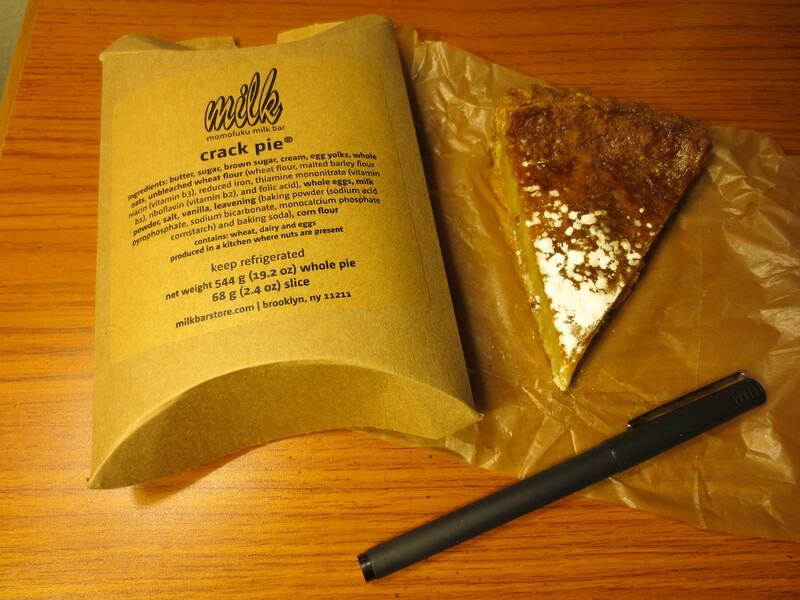 In fact, the Momofuku Milk Bar actually makes a dessert called Crack Pie, served in a small cardboard sheath akin to an alcoholic’s brown paper liquor store bag made of nothing but brown sugar, copious amounts of butter and cream. I stumbled upon the Milk Bar and its noted pastry chef Christina Tosi while watching an addictive television series called Mind of a Chef about the creative genius of Chef David Chang. Chang is one of my favorite chefs because he takes every day ordinary things and makes them extraordinary. It’s not that watching him make gnocchi out of cheap, grocery store ramen or doing amazing things with dried milk powder makes me drool; it’s the crafty thought process behind taking things that he was forced to eat growing up and then turning them into wizardry combined with new ingredients from his grown up palate that stokes my admiration. Non-pretentious and joyous creation is what made him famous more so than being just another guy cooking up delicious dishes. His zest for the craft shows and takes me back to the days when I sat in my own bedroom with a Ready Bake Oven, powder chocolate bags, an adjacent science laboratory kit and lots of bottles of lotions, oils and half used lipsticks. I loved pouring them all together and lighting them on fire in ways only a former latchkey kid can truly grasp the bliss within. Only Chang’s grown up combinations have landed him with over half a dozen restaurants where the fun continues. He chose a perfect person to hold court at Milk Bar in Tosi because she does equally zany, fun in the preschool playground things such as making ice cream flavors inspired by the taste of leftover cereal milk and banana cream pie from the gross, black rotten bananas that her experimentation has taught her produces the absolutely best flavor. This is why I wanted to taste her cookies so bad, especially the odd pure corn version that was touted as a densely, sugared, sweet creamed corn bread. That and the blueberries and cream beast that was so moist it had the heft of a baseball in my hand. And the double chocolate sin fest that held the perfect ratio of crispy outer crunch to inner, soft and mushy core. The crack pie never made it back to California, which is probably best because by the time I downed the three baked-to-perfection cookies (still amazing after two days in a plastic bag and a flight across the states) not an ounce of my internal cleanse perfection remained – only a severely worthwhile sweets high and a desire to visit New York City soon if only to lap up the Milk Bar’s mile high cakes next.